The coveted Balfour Trophy has been captured for the first time in its 114 year history by a player from Disley Golf Club.In a year that has got off to a flying start at the club with the junior team retaining the D&C Gross Trophy making it an impressive 7 titles on the run and qualifying for the English Inter Club Championship and Assistant Pro Scott Jackson winning the Manchester Alliance Assistants order of merit along with the Assistants Matchplay Title.It is remarkable that it has taken so long for somebody from Disley to win the trophy donated by Lord Balfour a frequent visitor to play the Lyme Park course when he visited the area on his parliamentary duties around the late 1890’s where he formed the Balfour & Houldsworth Golf Society with his fellow parliamentarian Sir William Houldsworth an M.P. from the East of Manchester. The honour of being the first has fallen to the current Captain of Disley Steve Misell after his fine nett 69 to win the trophy by one shots from Chorltons Peter McManus with a host of players on 73 requiring a card play off to settle the minor places. 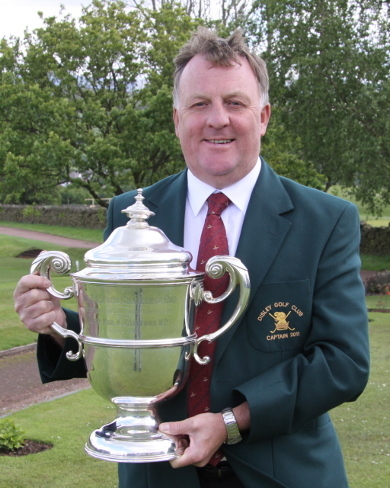 Disley also claimed the best gross score as Tony Collinson posted a 72 playing off a handicap of one. Davyhulme Park Golf Club produced not only a superb course for the event but worthy winners in Derek and Jenny Page with 38 Points that needed a card play off to give them the trophy over Craig and Karen Cuthbert. 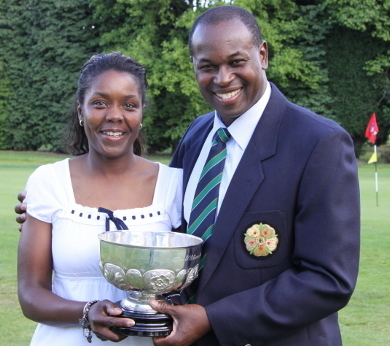 The Stand pairing of David and Angie Howarth made sure of third place with a 35 Points total. With seven pairs all carding a 33 Points total the count back went in favour of Lowes Park Capt and Lady Captain Andrew Royds and Lisa Stanley for a well earned fourth place.